Board members from Poway Unified School District voted Monday night to cut more than 100 positions. Eliminating 130 non-teaching jobs will save the district almost $5 million. 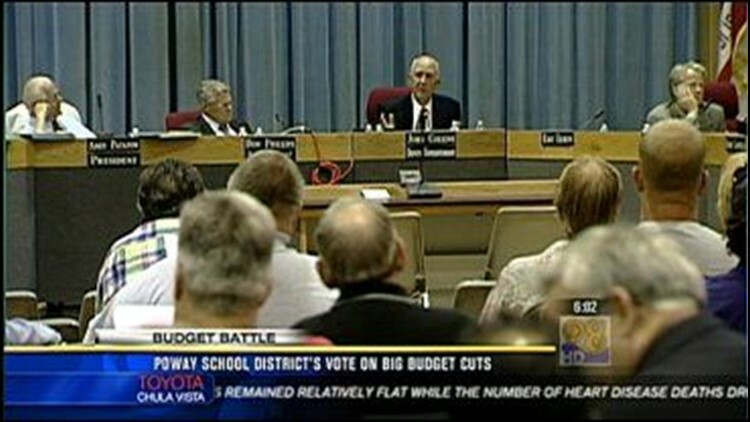 The Monday night vote in favor of the cuts was unanimous. The board also approved 2.7% in pay cuts that several employee groups have agreed to take in the coming fiscal year. Those salary rollbacks will save the district more than $1.3 million per year. The SEIU members, affected by the layoff vote, will meet to see if it can also do the rollbacks to save about 10 of the 130 jobs, which include custodians, secretaries and clerks, library and music assistants, and groundskeepers. The teachers union voted on a similar rollback Monday afternoon, but results of that vote won't be released until Tuesday.